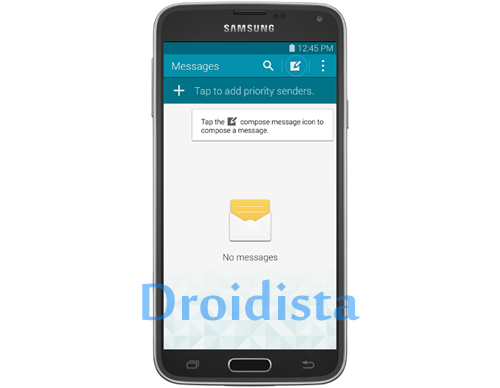 This post will guide you to control options for both text and MMS messages on your Samsung Galaxy S5 smartphone. It allows you to set message limits, notifications, size settings, etc., but first you need to access the messages settings menu where you can find all necessary options to personalize or customize how you receive messages. This guide will show you how to access Messages Settings Menu and provide information to every option. This is intended for Galaxy S5 owners who may still be learning a thing or two about their devices. For those who may have already mastered the device, I'm sure you can find some useful information here as well. Touch Menu and choose Settings. Scroll to and tap Settings and choose Messages. Default messaging app - this will let you choose an app to make it as the default in sending and receiving messages. Bubble style: choose how your messages appear by changing the style of the bubble that surrounds each message. Background style: you can set the background of the message screen. Change font size: if you enabled this option, you can simply hit the Volume Up or Down keys to change the font size while reading a message. Quick responses - you can create or manage your own text phrases that you can add to your messages. Text messages - there is one sub-menu under this option. Auto combination: you can set the messaging app to re-assemble messages that are received in multiple parts to be displayed as a single message. Multimedia messages - there are four options you can choose under this menu. Group conversation: this will allow you to control how messages to multiple recipients are handled. When enabled, a single message will be sent to multiple recipients, otherwise, a separate message is sent to every recipient. Auto retrieve: when enabled, attachments will automatically be downloaded upon display of the MMS, otherwise, only headers will be visible in the message list and you will be prompted to download attachments. Roaming auto retrieve: choose whether attachments are automatically downloaded when your phone is roaming or outside its home network. MMS alert: when enabled, your phone will alert you if the text message you're sending is considered as MMS. This comes in handy for people that include emojis while using the stock messaging app. Text message limit: set the maximum number of text message per conversation or thread. Multimedia message limit: set the maximum number of multimedia (MMS) message per conversation or thread. Notification sound: choose an audio to play when you receive new messages. Vibrate: choose if you want vibration to go along with the sound when new messages are received. Repeat message alert: this will allow you to choose how often your phone notifies you of new messages. Pop-up display: when turned on, a new message pops up on the display when received to notify you. Preview message: when enabled, a short preview of new messages will be displayed in the Lock screen and/or Status bar. Emergency alerts: choose what messages to receive. You can turn off almost anything but not Presidential alerts. Emergency notification preview: you can play a sample emergency alert tone under this option. Vibrate: choose vibration options for emergency alerts. Alert reminder: set the alert interval according to your preference. Signature - you can set your phone to include your signature in every message you send. Edit signature: you can customize your text signature in this option. Spam filter - you can set criteria your phone will follow to block messages that may be considered spams. Touch the slider to turn On/Off the option. Add to spam numbers: enter numbers you consider as spammers so messages from them will automatically be flagged as spams. Add to spam phrases: enter phrases you consider as spams. Once the phone detects these phrases, messages containing these phrases will be flagged. Block unknown senders: when enabled, messages from numbers that are not included in your contacts list will be blocked. Delay message sending - you can specifically set the length of delay before messages are sent. Timed messages can be canceled if needed and this option will come it handy. Safe mode - choose options for working with messages when your phone is in safe mode. That's it! I hope this post can somehow help you in setting your messaging app to work according to your preference. For questions and problems, send email to harold@droidista.com, I will get back to you as soon as I can. Thanks for reading.